Ever since I was a small girl, I have been enchanted by The Secret Garden* (or on Kindle *). So I let out a little squeal when I realised it was the block for February. Even better was I was not long down the rabbit hole that is a new webseries, with The Misselthwaite Archives having captured my attention on YouTube – to the point I would rank it up there in the top two of my favourite webseries. Those who were around in the time of my adoration of the Lizzie Bennet Diaries will know what a big call I’m making there. It’s been a long time since I have madly refreshed my YouTube app while feeding at 3am waiting for a new episode to be uploaded. I grabbed my well-loved, battle-scarred paperback copy off the shelf, and let myself get sucked into Mary’s world. I shivered with her at the mysterious cry in the night. I felt the uncertainty as she tried to navigate the new social mores in a country she knew was “home” but that she’d never visited. I grew excited as she discovered the garden & helped it flourish. Despite my numerous re-readings, I dropped pretty much everything and with a couple of late nights under my belt, two days later, the book was done. I also own this sweet “Collectors Library” edition* in hard back – I started collecting these for Bear, his first Christmas. I already own Alice in Wonderland & The Secret Garden (among others), so with some not so subtle encouragement from certain people, I have decided I will be collecting the stories I am missing in this format to read along each month. March’s book arrived earlier in the week, and I am itching to get stuck in – but first I want to get Mary finished. I’m so close, but February became a mixed up kind of month & I let myself fall behind. 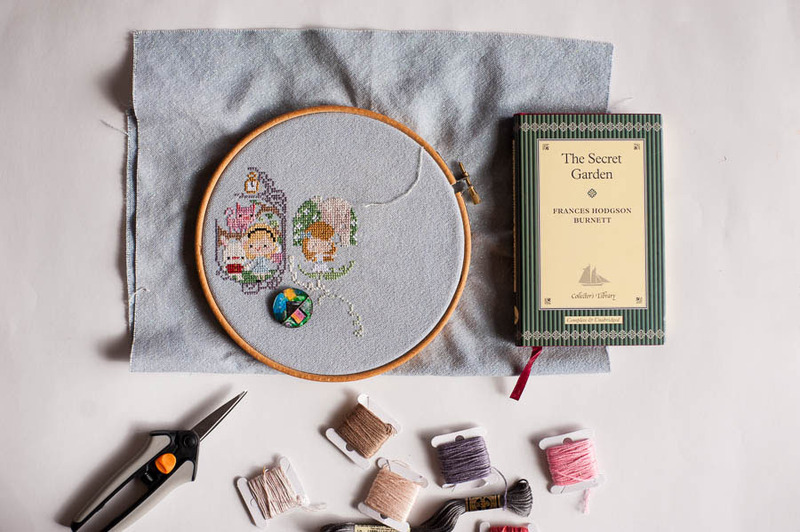 Tonight, I will stitch madly, and hope to have the finished piece ready to share with you on Sunday for the And Sew We Craft Classic Bookclub (& stitchalong). Am I the only one with this problem stitching on linen? I love the look of it, so I’m not going to switch any time soon, but I’m looking forward to going back to my Once Upon A Time which is so much easier to use, when I need a break! * – denotes affiliate links, by clicking on these I may make a small commission (at no cost to you) should you choose to make a purchase.